If you live within reach of the south coast, a popular place to visit is Brighton and all the hustle and bustle and atmosphere it's famous for. If calm relaxation is more your thing I suggest cutting your journey short and instead stopping at Lewes. 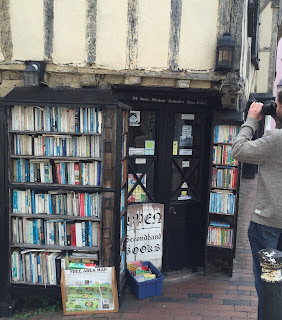 Apart from the lure of all the bookshops named in a guest post I have to admit the town had largely passed me by before my visit, which may be a sign of my ignorance but could also highlight the genius of its understated appeal. The visit took place on a warm Sunday when whole swathes of the town were closed, so that might also have skewed my experience somewhat, but the joy of the day was the relaxed, understated pleasure of gentle exploring. We wandered quiet streets, discovered ruins and enjoyed stunning views through gaps in the buildings. We also visited a bookshop that just happens to be an historic landmark. Fifteenth Century Bookshop is named for the age of the building it's housed in, and even the most dedicated of internet shoppers would surely struggle to walk past without at least pausing to admire this structure. Outside, the ground floor is lined with either bookcases or windows of books, while look up and ochre yellow walls are interlaced with wooden beams. I'm yet to see another building like it and left my boyfriend out there for some time as he put his camera to good use photographing interesting details. The first thing I noticed is that the contents are quite a mix, with an initial assessment of it as a standard secondhand bookshop not being entirely accurate. Yes, the stock is secondhand but the majority of those books are collectable, with a selection of standard pre-loved books scattered in between. In their own words, they sell anything from: "From rare and collectable to recent and readable". The shop is also a well organised mix, with clearly arranged sections that occasionally verge ever so slightly on the untidy, inviting browsers to dive in and discover what treats are to be found. The first room is dominated by the children's books. From standard, relatively modern paperbacks to beautifully bound hardbacks of yesteryear, this area contains all a young child's library could want and more. Prices vary from cheap to amounts you have to think about, but everything felt appropriately valued. Other genres are available in this room, or you can wander through a short corridor to a longer, more modern feeling room where the general fiction mostly lives. Walkways are narrow and shelves are full, but even with other customers the space never felt cramped or uncomfortable – although you'll have to take my word for it as I forgot to take any photos inside. As children's books are Fifteenth Century Bookshop's speciality, my purchase came from this section, albeit from among the standard paperbacks. 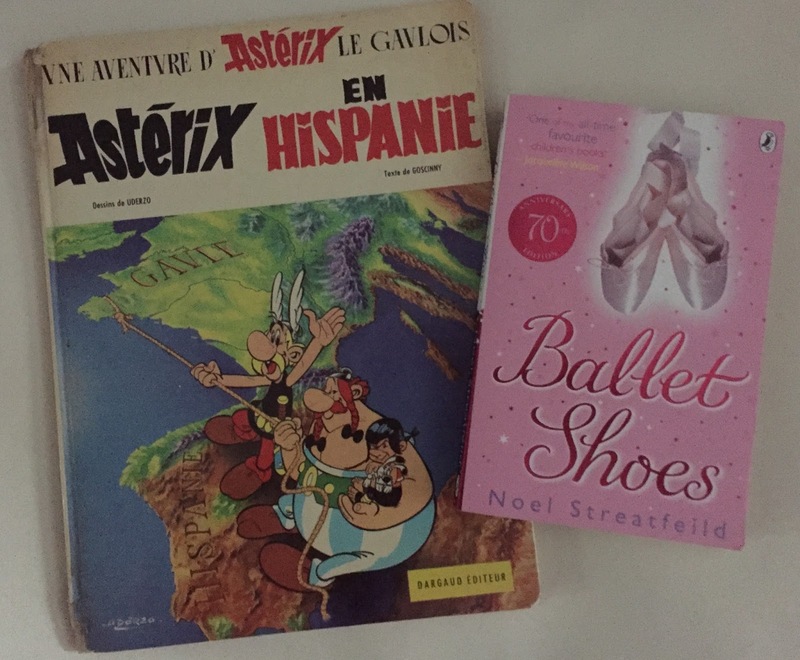 I picked Noel Streatfeild's The Ballet Shoes, while my boyfriend enjoyed the variety of the foreign language offering and chose a French copy of Asterix in Spain. I'm ashamed to admit I could understand very little of his purchase. We may not have chosen anything pricey or rare, but I can't help feeling these books are a good example of the interesting diversity of the bookshop's shelves. Importantly, the browsing experience was as relaxed and pleasant as the rest of our time in Lewes. Next time I'm looking for a quiet retreat I know where I'll be heading. I really enjoyed it for some relaxed exploring, bookshops, good food (I especially hear the Snowdrop pub is worth a visit and need to return to find out) and random history.